The most common Laburnum in the UK, by a huge margin, is the common Laburnum (laburnum anagyroides) and the hybrid Laburnum x watereri 'Vossii'. Another common generic name is the Golden Chain tree. There are other types but for most gardeners these are the ones that grow best in most parts of the UK. This is an easy and trouble-free tree to grow but there are a few points to be aware of. Use the list below to decide if this is the correct tree for you and your garden. This is a deciduous tree which has green leaves from March to November. It sheds leaves in late autumn. It reaches full size after about 15 years. Expect a maximum height of 7 metres / 22ft and a spread of 6m / 19ft. It produces a magnificent display of flowers in late May to early June which lasts two to three weeks. See the pictures below for an idea of what to expect. All parts of the tree are poisonous to humans and animals. The most likely danger comes from children eating the seeds. These are contained in pods which look a bit like small and rather flat pea pods. Occasionally these can be mistaken by children for peas and eaten. See the section at the end of this article about the extent of the danger. This is often wildly exaggerated. Laburnum trees which are planted near to ponds will almost certainly poison any fish in the pond. They will grow well in almost all soils but, like many trees, do not do well in water-logged ground. They will grow in sun to partial shade will but produce the best flowers in full sun. Very hardy and will withstand temperatures down to -20°C. The tree does not require any attention when established. Do not feed, especially not with a general nitrogen fertiliser. Water only in extreme drought conditions. 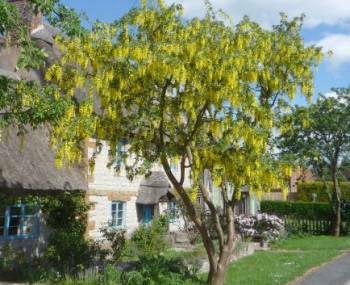 In many situations your laburnum will produce a huge display of flowers one year and not so good the next year. This is quite normal. Laburnum watereri is a naturally occurring cross between Laburnum anagyroides and Laburnum alpinium. The commonly grown Laburnum x watereri Vossii was bred in Holland during the 1800s. This variety has been given an Award of Garden Merit by the Royal Horticultural Society. One or two year old called a "whip". Price range £15 to £20. Half standard. Price range £40 to £45. 15l pot / 2.5m high. Price range £35 to £45. 30l pot / 3.5m high. Price range £80 to £90. Our problem with this supplier is that the headline price is quoted without VAT. What planet are they on! All amateur gardeners have to pay VAT so why do they quote a price without VAT? We realise that businesses may be able to claim the VAT back but at the prices this company is charging compared to others, we doubt that they do much business of that type at the quoted prices. Our test purchase of a Laburnum showed an initial price of £49.99 (already considerably more expensive compared to many other plant nurseries). After VAT has been added to that, and the delivery charge included, it came to a massive £71.93. 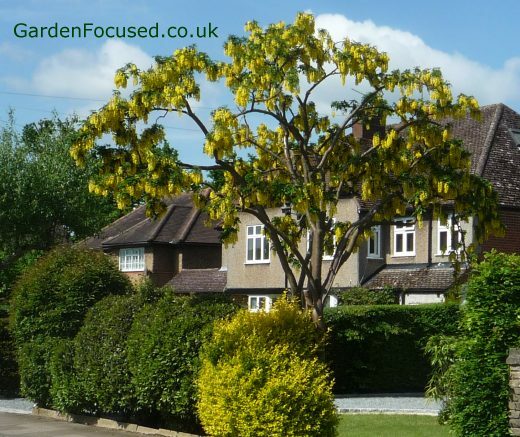 Planting a Laburnum tree is no different most other small trees. But before you plant it check that it will have sufficient room to grow to its eventual maximum height of 7 metres / 22ft and a spread of 6m / 19ft. For the best flowers choose a full sun position. These trees grow well in almost ground but do not do well in water-logged conditions. 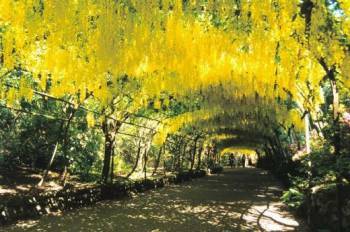 The best time to plant a Laburnum is from September to March. As a rule of thumb and to be on the safe side, plant your tree at twice its eventual height from any buildings to avoid damage. Dig a hole twice the width of the existing roots and set it into the hole to the same depth as it was in the container. Gently firm the soil around the roots and water well. Sprinkle a couple of handfuls of blood, fish and bone into the surrounding soil and work in gently with a trowel. 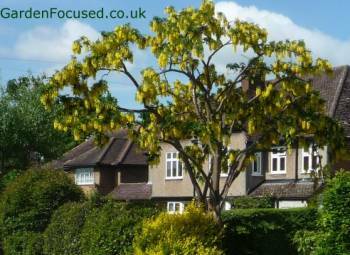 Your Laburnum tree is unlikely to need any pruning throughout its life but if it does, the best time is in July when it is strongly growing. This will minimise the risk of fungal infections attacking the pruning wounds. HOW POISONOUS ARE LABURNUM TREES? According to the book 'Poisonous Plants: a guide for parents and childcare providers' by (author Elizabeth Dauncey) there is an average of 2 people killed in the UK by all plant poisoning. The plants most likely to be among those two each year are hemlock (not widely sold) and yew. Although eating any part of the laburnum tree can cause very unpleasant side-effects, the risks of death are minimal. Compare that that to the estimated 6 children which were killed in bicycle accidents in 2015 (ROSPA) and it's clear that there are far more dangerous things in life than laburnum trees. To minimise the risk, the hybrid Laburnum x watereri 'Vossii' produces very small amounts of fruits compared to the common Laburnum. They are a common sight all around the UK in gardens and parks. Perhaps the most famous is at Bodnant Garden in Wales. Another less well known Laburnum arch is at the Dorothy Clive Garden in Shropshire. The best time to harvest laburnum seeds is when the seed pods are are brown but not yet quite open. Mid September is normally about the correct time, but this does differ depending on your local weather conditions. The seeds have a very hard coating which needs to broken through if the seed is to grow. To do this, fill a small jar or cup with warm, but not boiling water. If it burns your mouth it's too hot, 75°C is about right. Add the seeds to the warm water and leave them to soak for 24 hours. After soaking the seeds examine them. Many should have swollen significantly, to about three times their original size. These seeds are the ones to select. Discard the others or try soaking them again in slightly hotter water. Fill an 8cm / 3in pot with good quality multi-purpose compost and let it soak in a shallow tray of water for half an hour. Remove it from the water. Use a pencil to make four equally spaced 2cm holes in the compost. Drop one seed in each and cover with compost. Place the pot is a cool area (dark or light) at about 15°C - 20°C / 60°F - 68°F. Do not let the temperature rise much above this temperature. A cool windowsill, not facing the sun, will normally be about correct. Avoid placing the pots above a radiator. The seed normally take three to four weeks to germinate and appear above the compost surface. As soon as the seedlings appear move the pot to a cool, light and airy position on a windowsill. Keep the pot slightly on the dry side, but water well when the top 3cm is dry. In late Spring move the pots outside but don't expose them to frost. Keep watered as above. when the seedling reaches twice the height of the pot, transfer it to a new larger pot of about 12cm width. Pot up again when the pot becomes root bound. The tree can be planted in its final position about 2 and a half years after planting the seeds. make this in mid May time so that the tree has six months or so of growing time outside in good weather. Harden off the young tree for a couple of weeks before planting out. For the first summer outside make sure the tree is watered well in dry periods but do not waterlog it.